I’m not the biggest lover of a sheet mask if I’m honest. Don’t get me wrong, some sheet masks are very nice on the skin as well as being easy to use and great to travel with but I struggle with the overall wastage from sheet masks. 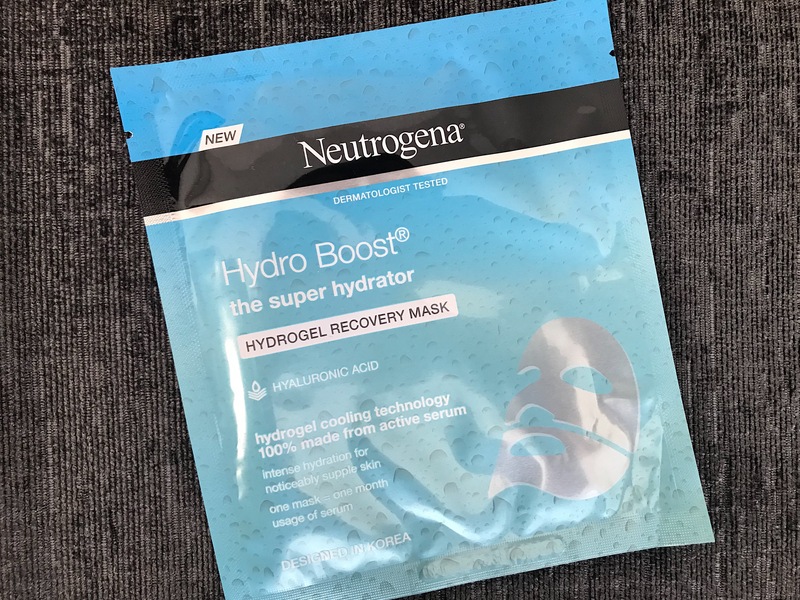 First of all, every sheet mask I’ve used tends to have a lot of product leftover on them or in the packaging– it always seems a shame that you can’t often use these more than once. Which also brings me onto my next bugbear -sheet masks aren’t very environmentally friendly. After one use, you throw them out whereas with a face mask from a tube or a tub, they give you multiple uses. 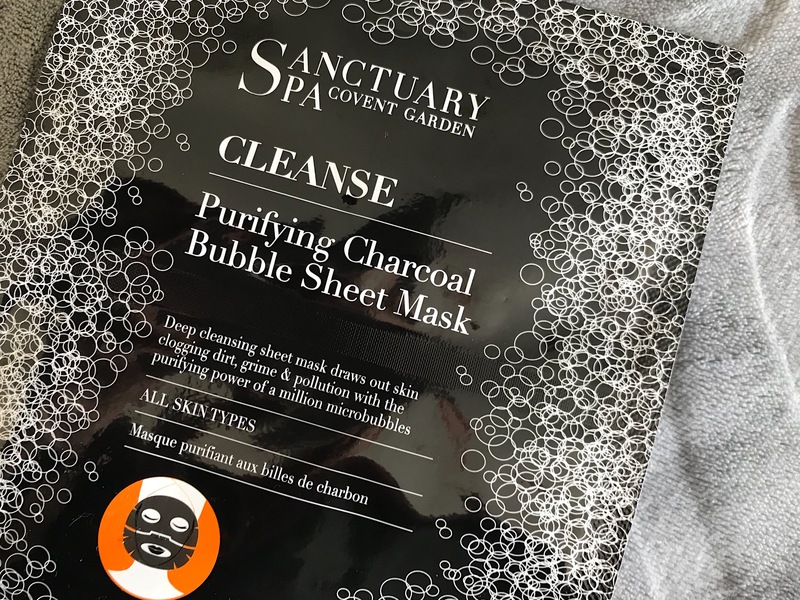 My sheet masks views set aside, I have been recommended a couple of masks to try – Sanctuary Spa Purifying Charcoal Bubble Sheet Mask and Neutrogena Hydrogel Recovery Mask, so I thought I would give you my review of these across two post (2nd part coming on Thursday!). 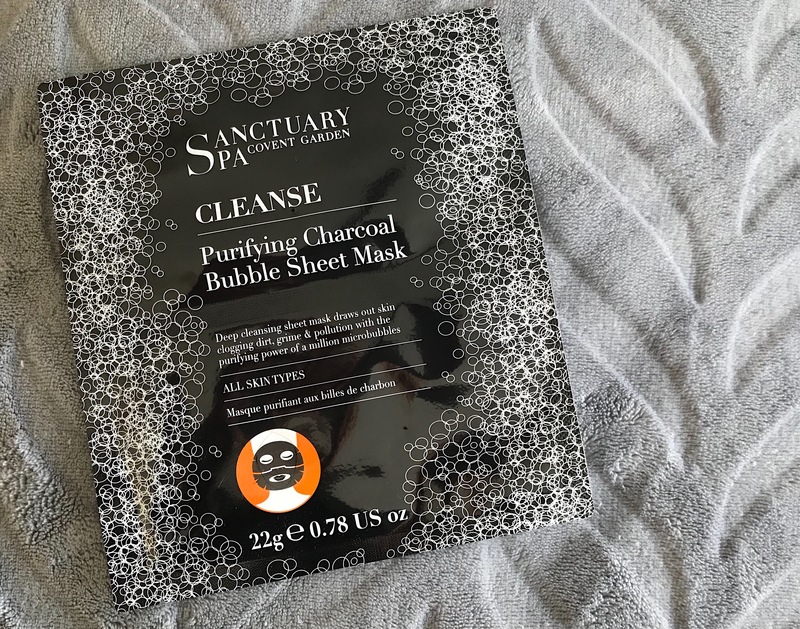 First post, I’m starting with Sanctuary Spa Purifying Charcoal Bubble Sheet Mask. Recently I’ve noticed quite a few brands popping up with bubble sheet masks, trying to bring something new to the skincare aisles. They generally work by creating small bubbles underneath the mask to cleanse and withdrawn impurities under the skin. 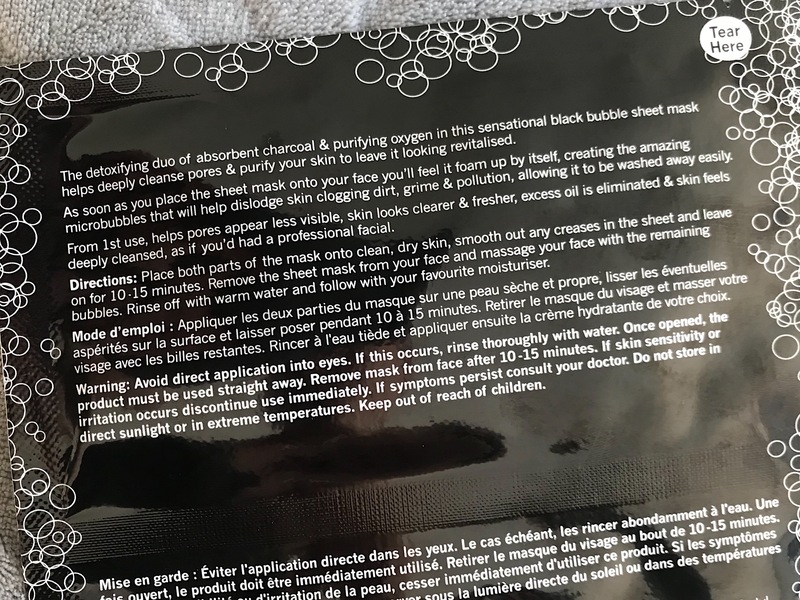 The Sanctuary Spa Purifying Charcoal Bubble Sheet Mask says it’s a “deep cleansing sheet mask drawing out skin clogging dirt, grime and pollution with the purifying power of a million microbubbles.” This masks comes in two parts in order to better fit to the face and as you take it out of the packet you can feel the black sheet soaked in cleanser. As I applied it to my face, I instantly felt the bubbles going to work underneath. The one thing to note here however was that I was a bit confused on the fit of this mask as both sections (top and bottom) both covered the nose area – I’m not sure if I fitted this incorrectly, whether it was just excess mask (and therefore a waste! ), or if the double layering of the mask is to gain extra strength to an area of the face commonly known for dirt build up. If anyone can help me with this – please do let me know! Anyway masks fitted (yes, I look ridiculous! ), I laid down on my bed and set the timer on my phone for 15mins. 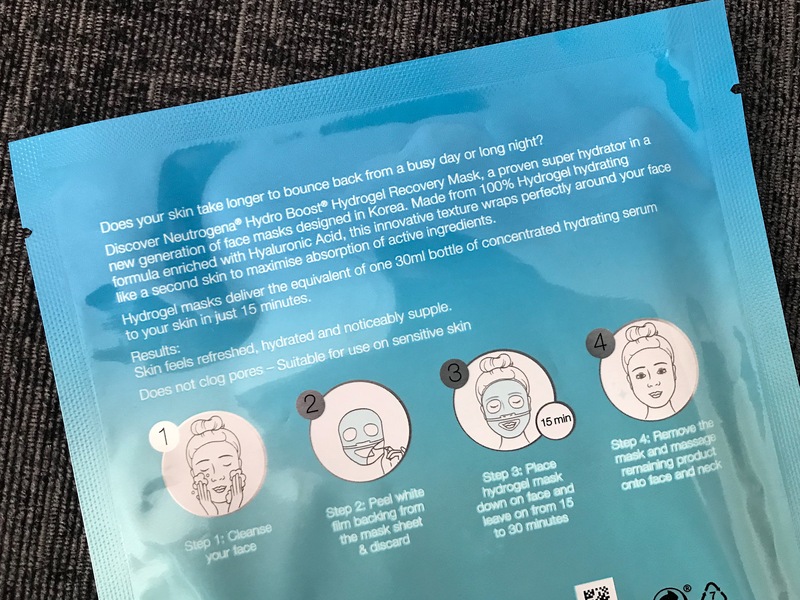 I have to say, I do quite like this about sheet masks – because you can’t really move around with these masks on as they will slip off your face, so it does force you to physically laydown and relax. As I lay there chilling out, I constantly feel a tingling sensation all over my face as the bubbles did their work which felt really nice! Once the 15 minutes were up I walked back into my bathroom and had a look in the mirror. I was a little taken aback to find the top of the mask had foamed up too and I was left looking a little like The Moon – Noel Fielding style (anyone a fan? I’ve just gone into a YouTube rabbit hole at watching these videos!). As I removed this mask from my skin, you could see all the tiny microbubbles still all over my skin, which I then rubbed into my face before rinsing my face with warm water at instructed. Once I rinsed the mask off, it did leave my skin feeling very clean. It did also feel a little tight which I thought might have been the case with the charcoal element of this mask, so following up with a good moisturizer is necessary. My skin didn’t however feel stripped of moisture which I thought might have been the case with a foaming type cleanser. Overall I did really enjoy this mask, however the curse of the sheet mask product wastage was definitely present here. I definitely felt I could of used this product twice however the nature of the foaming meant it was far too messy to save any excess product and I had to throw the mask in the bin once I had finished. Would I buy this again? I’m still a little torn as I don’t like the wastage from this sheet mask, but I do like the after effects of this mask and also the need to take 15mins to relax and let this sheet mask work its magic. 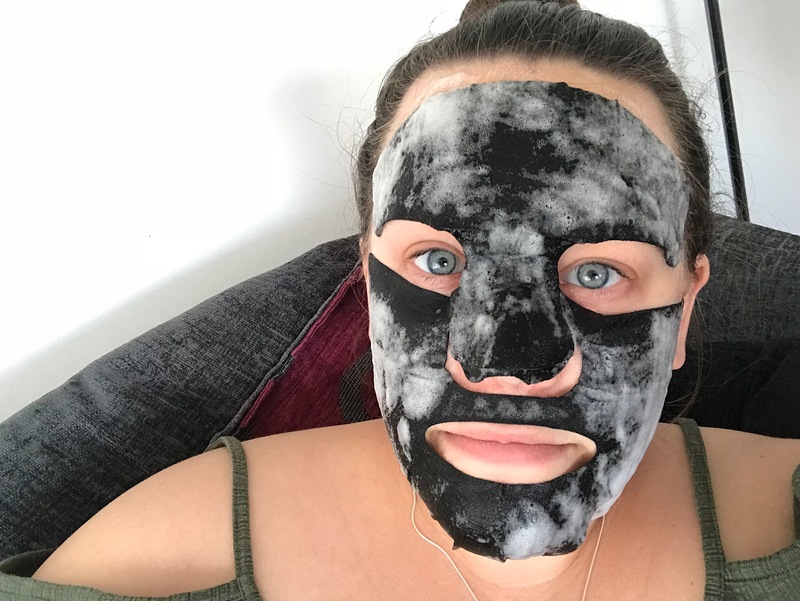 I might therefore pick this up again if I’m looking for a special pamper treat but for regularly face mask treatments, I might stick to the Beauty Pie Super Pore Detox Black Clay Mask which almost does the same job. Have you tried out the Sanctuary Spa Bubble Mask before? Or tried any other bubble masks? Spoiler alert: the best beauty box I’ve ever received! In celebration of The Sunday Times Style Beauty Awards, Sunday Times have partnered with Latest In Beauty to give people the chance to try out the shortlisted products before you vote. If you haven’t heard of The Sunday Times Style Awards, it is annual awards with winners chosen by readers. With a whole range of categories from best skincare brand, best lipstick, all the way to best eco-friendly beauty brand, readers can select their favourite products with also a chance of winning prizes. The Sunday Times Style beauty box costs just £25 (+ P&P at £2.95) and allows you to pick six products from a list of 60 shortlisted products from the awards. The amazing list of brands range from; MAC, Rodial, Charlotte Tilbury, Benefit, Real Techniques, Paula’s Choice, Elemis, Burt’s Bees…and the list goes on! There is also a great range of full size products you can pick from too which is amazing! Be warned however there are a lot of products coming in and out of stock.